Its customary for Filipinos not to cut the hair until the child reaches 1 year old. Whether right or wrong, I dont want to question that. I followed that belief in dealing the first haircut of my kids. 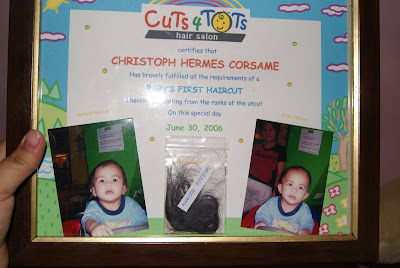 Of all the kids, I only documented the first haircut of Christoph through the help of Cuts for Tots Salon in Glorietta. I didnt know during Francis time that saloons for kids are offering this kind of certificate. No big deal actually but I know this will be a good keepsake for Christoph when he grows old. For Alexa's case, I purposely did not cut her hair only until recently that I instructed the yaya to have it cut whilst I was in Germany. Again, no documentation. Too bad. 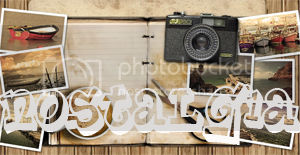 Anyway, attached is the photo of the picture frame received from Cuts for Tots. That is a very good remembrance sis. 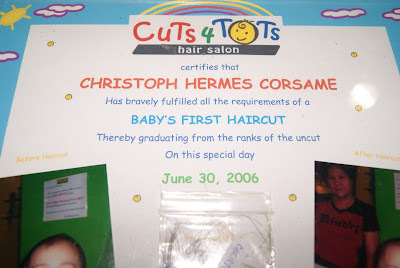 In here, it is customary too that the first hair cut is free lol..
Aww, what a cute memorabilia. My little just reached 1 year old but i haven't cut his hair coz it's very thin.